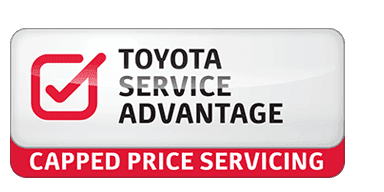 If you're not a big fan of unwanted surprises, you're going to love Toyota Service Advantage[B20] set, capped price servicing. So every time you get a logbook service you'll know exactly what you're paying, in advance. This includes all labour costs, oil, fluids and any Genuine Parts required. So it’s easy and affordable to get the best possible care for your Toyota. What a great way to budget. Contact the team at Maddington Toyota to find out more about capped price servicing. To check eligibility, or if you'd like to check your service schedule, simply click on the link below and enter your vehicle ID number (VIN). Check if your vehicle is eligible. View Terms & Conditions of Toyota Service Advantage. [B20] Maximum payable for standard scheduled servicing (normal operating conditions). Excludes Goverment, Rental, Fleet Not for Profit and Toyota Employee Family Vehicle Purchase vehicles. Contact Maddington Toyota for other exclusions and eligibility.